When the folks at Taconic Investment Partners and Douglas Elliman invited me for an exclusive first look at the Sterling Mason sales office at 459 Washington, I hopped on a Citi Bike and braved the cobblestones: Not only is the new development on a large chunk of prime northwest Tribeca—the south side of Laight between Greenwich and Washington—but I suspect the building will end up being architecturally noteworthy. What architect Morris Adjmi has done is leave 401 Washington (or at least the shell of it) more or less alone, while creating a new building to the east (412 Greenwich, formerly a garage) that mirrors its partner; the address for the combined duo will be 71 Laight. Where the design gets really interesting is the choice of materials: The Mason façade is terra cotta, while the Sterling façade will be grayscale and metallic-looking. The original idea was to sheath Sterling in metal, but that proved too unwieldy, so now the first floor will be cast aluminum and the floors above will be a cement composite or reinforced concrete panels with a metallic finish. Achieving what landmarks folks call contextuality while avoiding pastiche and injecting a contemporary edge is a rare triumph. It’ll do, right? The Juliet balconies in the floor plan look out onto the 40-by-60-foot interior courtyard, which is being designed by Deborah Nevins. 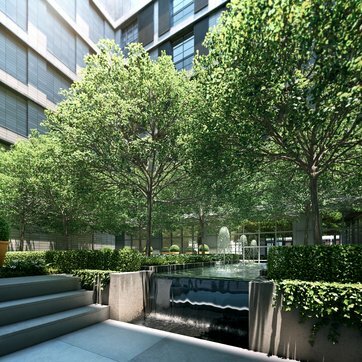 The space is communal, and mostly designed to be admired from the residences (although one could certainly imagine relaxing quietly under the hawthorn trees and next to the fountain, as seen in the model and renderings below). Windows on the courtyard have sliding metal shutters that reference Tribeca iconography. John and Christine Gachot, who have worked extensively on André Balasz’s projects, designed the interiors, and they sourced from within the U.S. whenever possible. The Gachots enlisted Henrybuilt for the millwork; this is the first time Henrybuilt agreed to participate in a project of this size. Take a look below at the detail of the walnut cabinets in the model kitchen at the sales office. That’s nice stuff. The vent (yes, it goes to the outside) is powder coated, the floors are white oak, and the counters are Imperial Danby marble from Vermont. Of special note are the light fixtures in the kitchen and bath: They were custom made at trans.LUXE over on Walker. There are two elevators for the 33 residences (or fewer, if any buyers combine), a live-in residential manager, a library lounge with dining area and kitchen facilities (for your caterer, obvs), an exercise room with yoga space, a programmed children’s playroom, and a self-park garage with 12 spaces and an entrance on Greenwich. Hard as it may be to imagine, there are celebrities out there who don’t actually want to be photographed all the time. Below: the pretty lobby, seen as you approach from the entrance, on Laight. Those of us not likely to become Sterling Masonites will still be able to get inside the building in one way: The Greenwich side has a yet-to-be-rented 3,850-square-foot retail space on the ground floor. The Washington side—which is a few feet above grade (and has even less foot traffic)—will be residential. New structure here is up to street level. And new steel has gone in next to the old part of the structure. That side wall is very beautiful. Lovely. Savor it while we can. But, then, we're getting something of real quality here, so its (not quite) disappearance won't be such a loss. If it was a Kaufman, this might be the facade. 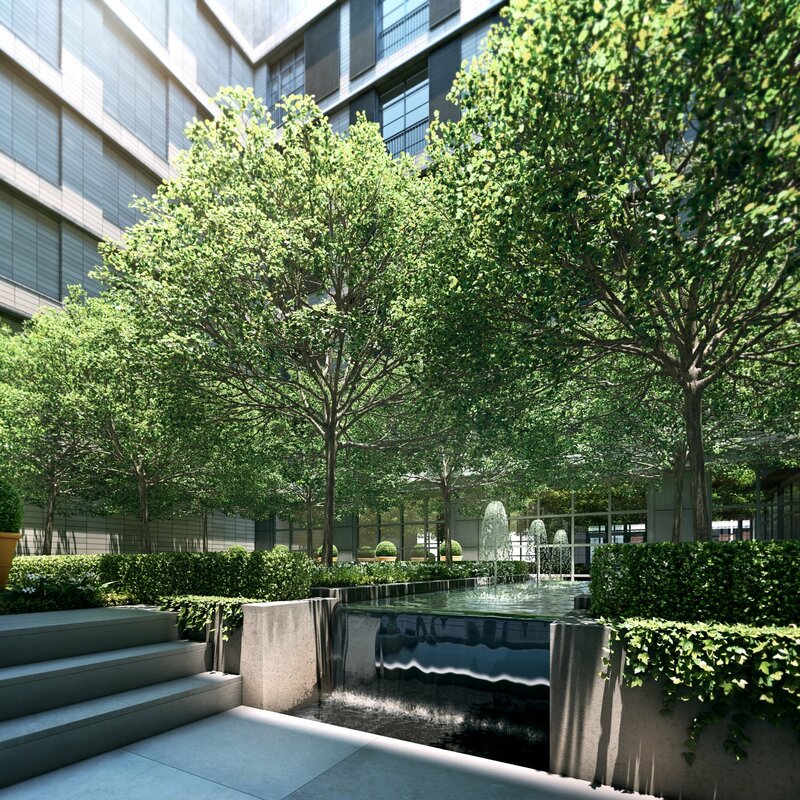 A rendering of the courtyard to be built at the Sterling Mason, a new luxury condominium building in TriBeCa. Deborah Nevins is one of the most sought-after landscape designers in the world. She has seeded and sodded estates for the likes of the entertainment mogul David Geffen, the Greek shipping magnate Stavros Niarchos and the media tycoon Rupert Murdoch, and her haute habitats dot townhouse backyards and prewar rooftops from Greenwich Village to Park Avenue. 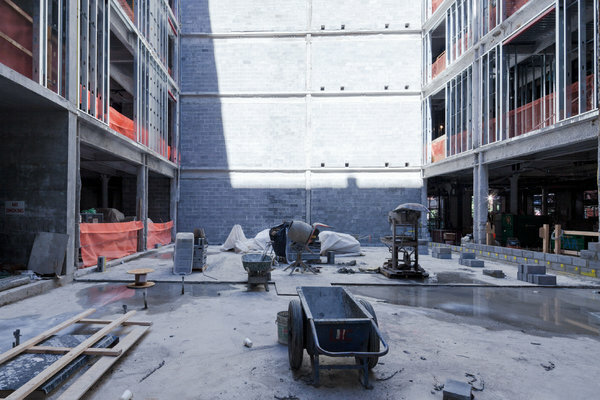 For her latest project, she is turning what would otherwise be a barren air shaft inside a new TriBeCa loft building, the Sterling Mason, into a lush 2,400-square-foot courtyard. Hawthorn trees telegraph the seasons, from rich white blossoms to lush green leaves, red berries and spindly branches. Ivy creeps along the ground, framing a sculptural stream. “It should be a remarkably peaceful space,” said Dan McInerney, a vice president of Taconic Investment Partners, which is building the 32-unit Sterling Mason, on Laight Street. To keep that peace, this most inviting oasis will be off limits, and not just to the general public. Even residents of the building, where apartments are going for up to $23 million, will be allowed to enjoy it only from the ground-floor lobby and library or their bedroom windows upstairs. The space at the Sterling Mason is under construction. The landscape designer Deborah Nevins will turn the barren air shaft into a lush courtyard. In the concrete jungle, one of the rarest amenities is actual foliage. In-building laundry — even yoga rooms and bike storage — is more common than a lawn, let alone one designed by one of the premier horticulturalists in the business. But at a growing number of upmarket buildings, the ultimate luxury offering is a miniature Gramercy Park, one so exclusive that no one but the gardener gets a key. No need to stop and smell the roses, developers and designers say. The Schumacher, a historic printing plant on Bleecker Street in NoLIta that is being converted, had an original light well from 1883, which helped illuminate the interior of the building. 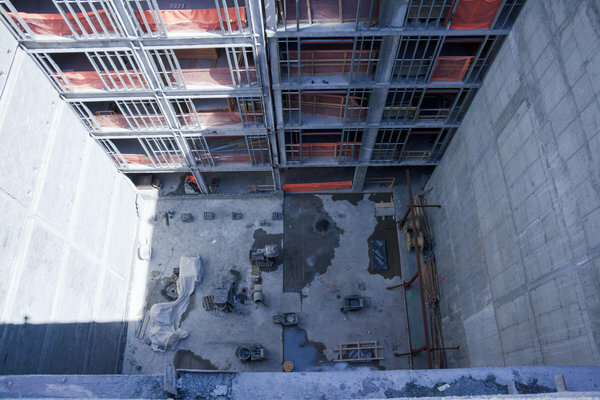 With 21 condos for $4 million to $25 million, buyers could hardly be expected to look out onto an empty concrete shaft, like the denizens of some nearby tenement. Worse yet would be if it became a party venue. 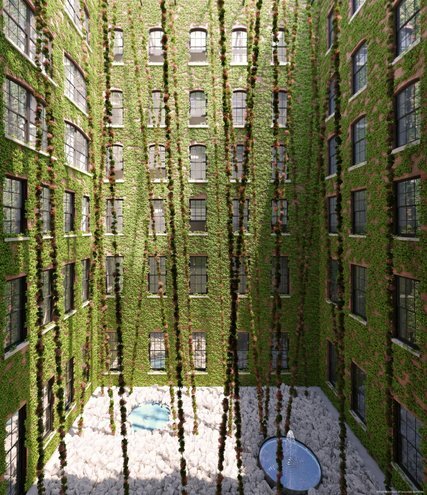 A rendering of the courtyard garden at the Schumacher, a historic printing plant in NoLIta that is being converted to condos. Ivy covers the walls — inspired by a stay Mr. Stillman had at the Hotel Plaza Athénée in Paris — and climbs along cables stretching from a base of crushed marble up to the roof six stories above, looking like alien tendrils. Further complementing the space will be a pair of sculptures by Jeff Koons belonging to the collector Alberto Mugrabi. He bought a pair of triplex units for $20.7 million and was so taken by the garden that he wanted to contribute to it. The newer residential gardens are largely an outgrowth of the current, post-bubble market, where financing has been scarce, leading to smaller boutique projects with larger units aimed at the wealthy. When apartments stop being cramped, there is less need to leave for a get-together on the terrace or in the courtyard. Plus, if the owners want to escape to nature, odds are good they already have a retreat or two somewhere. “Even if you have a place out East, upstate, the Riviera, a yacht, it’s still nice to wake up in nature,” Mr. Stillman said. Technology has also advanced to the point where these spaces require almost no maintenance, especially if they are off limits, which eliminates the need for shoveling and raking — seasonal pruning will do. Ample sunshine can be a problem, though, as well as layout. only from the ground-floor lobby and library or their bedroom windows upstairs. “You’re designing on two planes, for people in the lobby and the common areas looking out on the garden, but also from above,” Mr. Smith said. SK Development is tilling two look-but-don’t-touch gardens. Where others are manicured, the Reade Chambers in TriBeCa has one as wild looking as the High Line. At 10 Bond Street in NoHo, a sunken light well for the gym and retail space was turned into an oversize vitrine planted with a single 18-foot saucer magnolia to enliven the space. “We wanted to make the basement more than a basement,” said Scott Shnay, the principal of SK Development. While still uncommon in the city, this latest crop of gardens is a bit of a throwback, to an earlier gilded era. Grand turn-of-the-century apartment buildings like the Apthorp, the Dakota and Riverhouse all featured small, inaccessible gardens within their entrance courtyards. Since this golden age, most installations have been corporate ones, like Isamu Noguchi’s Zen garden at Chase Manhattan Plaza downtown and a stand of birch trees at The New York Times Building, though the goal is the same — a pleasant view and lots of light. The current apartment appellation owes a debt as well to the Museum of Modern Art, where Mr. Smith, the Schumacher designer, created a massive installation of plastic plants and fake rocks on the museum’s roof after its 2003 expansion. It is meant to enhance the view from residences in neighboring buildings. Even as New Yorkers are getting back to nature at urban farms, waterfront parks and green roofs, apartments boasting these Edenic refuges and their forbidden fruit may actually be the truest expression of gardening. An earlier version of this article misstated the history of one of the buildings with a garden, and misidentified its developer. The Schumacher on Bleecker Street was a printing press, not a watch factory, and the president of its developer is Roy Stillman, not Rory. An earlier version of this article misstated the size of the courtyard at the Sterling Mason. It is 2,400 square feet, not 1,000. This is just about ready for the facade. A peek at the Mason. 74 Laight, a co-op across the street, has been getting an exterior renovation.